Although the baseball team is currently tied for third place in the Atlantic Ten Conference standings, they were on the losing end of an embarrassing defeat this weekend. The Owls (16-16, 8-4 A-10) suffered a tumultuous 23-0 loss to visiting Richmond Friday at Skip Wilson Field in Ambler. The squad, which won two of five games last week, committed a season-high six errors and produced only six hits, the second fewest this season. The Spiders’ 23 runs came on 21 hits — 10 of which went for extra bases — at the expense of five Owls’ pitchers. Despite the loss, the Owls still won the three-game series, notching a 6-2 victory on Saturday and an 11-1 decision Sunday. On Saturday, junior right-hander Matt Mongiardini went seven innings, allowing two earned runs, to improve his record to 5-2. He leads the team in wins, innings pitched (48.2) and strikeouts (25). The next day, it was Matt’s older brother, senior Mike Mongiardini, who took the hill for the Owls and led them to a victory. Mike Mongiardini (2-2) threw 5 1/3 scoreless innings, allowing just three hits. He got to pitch with a lead thanks to the Owls’ three runs on five hits in the first inning. Earlier in the week, the Owls lost to No. 22 Saint John’s, 3-2. That marked the fourth straight game against a ranked opponent, as they dropped two of three to then-No. 18 Charlotte prior to the St. John’s game. Freshman pitcher Steve Nikorak made his collegiate debut against the Red Storm. He went seven innings in the defeat. In their only road game last week, the Owls lost to Towson, 9-5, Wednesday. After an off day yesterday, the Owls will return to the diamond this afternoon against Delaware at 3 p.m. From there, the next eight games will be played from the confines of Skip Wilson Field. The Owls are in the midst of a 12-game home stretch. The Owls are 6-8 at home this season. Eighteen of the Owls’ 20 games in April are scheduled to be played at home. 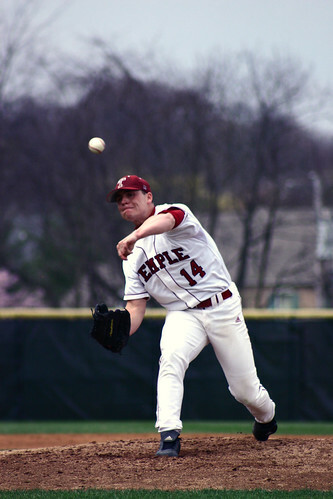 Todd Miller can be reached at todd.miller@temple.edu.